The never ending french menu…. 100-909 Burrard (at Smithe), Vancouver. Le Crocodile. Elegant. Expensive. French. Delicious. It totally deserves its standing as one of the best restaurants in the city. This is a reputation that Le Crocodile has earned over 20 years of serving excellent meals. How did the chef learn to be awesomest? By training at Au Crocodile with his mentor in Strasbourg. 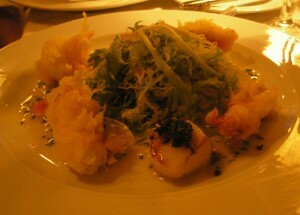 Le Crocodile has an excellent wine list and a long menu. There are far more options than I’ve seen at other high end places. It begins with over 20 entree options…and when I say entree I mean it the real european french way –> appetizer. I don’t know how entree came to mean main course in N. America — it makes no sense. Anyway, for entrees we settled on trying the lobster tempura and grilled scallops on endive salad (pictured above, 18.5), the tomato and gin soup with cream (8.5), the grilled asparagus and arugula salad (13.5), and the beef steak tartar (15). All of the small dishes were lovely in their respective ways – truffle oil and quail eggs here and there were lovely touches. And no, the soup does not taste like gin. It tastes like creamy tomato goodness. For the mains…or plates, we all found something so absolutely perfect that nothing was left unfinished. The menu stretches on and on. You’ll have about twenty options to pour over and then the waiter will spring a handful of specials on you. The prices range from $27-42. If you absolutely cannot decide, then go for the chef’s 5-course tasting menu at $75. It took me at least 20 minutes of near panic going back and forth between a few options, but I was finally able to decide and went with the lamb. 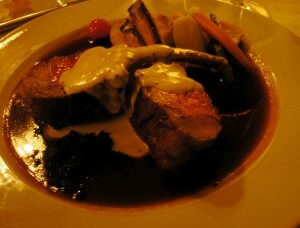 But it wasn’t just lamb — it was a gorgeously tender roasted rack of lamb with fresh thyme jus and mustard sabayon (39). The dishes my dinning companions fixed on were the roasted free-range chicken breast with pommery mustard and shitake mushroom risotto at a surprisingly affordable $26.5. So, does the whole organic, free-range thing really make any difference to the quality and flavor? You’re goddamned right it does. If you want your food to taste like anything other than wet styrofoam and salt, I mean. Go, organic, GO! We also ordered the grilled beef tenderloin served with peppercorn sauce (38), the roasted fraser valley duck served with pan-seared foie gras and an apple cider reduction (39), and I think the fifth dish was the lobster special. They were all so lovely. I cannot wait to return and have another sublime dinner experience. People have since asked me if the portions were good. Once again, french is about the quality not the quantity. But the portions were quite large and I felt extra sleepy from eating so much afterwards. We had an absolutly lovely domaine de la janasse chateauneuf du pape recommended by the sommelier. Btw – Crocodile’s sommelier is a super genius. He’s floating around waiting to dispense advice and he will not steer you wrong. The sommelier, like the rest of the service is quick to help out with clearing – I also saw the hostess serving during particularly busy periods. Not that the servers weren’t doing a fabulous job — our waiter was perhaps the best I’ve ever seen. Courteous, polite, outgoing, funny, a ninja, and an elephant’s memory to boot. Bonus: they served us four teeny extra dishes — I keep wanting to call them inter-courses…but that can’t be right; I think they’re actually called les amuse bouches. 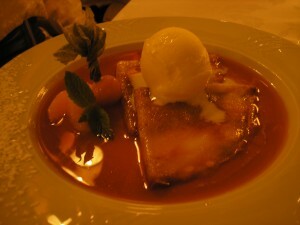 Anyway – before the appetizer we had a delightfully flakey smoked pork belly tart and warm breads. Then between the appys and mains they brought out a couple plates of super crisp frites. After the mains we indulged in some wonderfully bold cantaloupe sorbet served atop what we first surmised was robitussen…but was in actuality, port. And finally, after everything was said and done we were treated to milk and dark crocodile shaped chocolates. Mmmmmmmmm choco-crocos. These lovely added touches are part of what makes fancy restaurants prices seem more reasonable. You really have to ask yourself: Is it worth the price? Yes. Have I had food that was comparable in terms of price and deliciousness? Yes (Gavroche, Chambar). Is Le Crocodile comparable? Yes, but it’s even better than either of them. The only thing I turned my nose up at was the second sauce on the lamb — it was, what I could only imagine, was ranch dressing. The other brown sauce — though, was perfectly lovely. And let me add on – this is going easy for french sauce critique. Though each dish had at least two sauces – overall, they weren’t too heavy on the sauce. If you, like many of us, are not a millionaire. I have some tips: go for lunch – you can have the same excellent meal for 10 or 15 dollars less. If you neeeeeed to go there for dinner, my recommendations are as follows: first of all eat Kraft dinner for a couple nights to save money. It’s worth it. Next, skip the drinks and settle for tap water. Then just get the main dish – no appetizer or dessert. Or, alternatively, you could get just an appetizer and a dessert – no main. Open: 11.30 – 2 for lunch, 5.30-10 for dinner. Reservations: A must. Le Crocodile can only seat about 100 and it’s hella popular. Attire: It’s pretty varied – a dressy shirt with flashy jeans will suffice, a suit or fancy dress wouldn’t be out of place. But jogging pants? Please, no. Parking: There is valet in the evenings for $7. Otherwise good luck getting one of the two metered spots out front. Criticism: The outside of the building could use a facelift. The inside is a little cramped and the classic french decor comes across as drab and uninspired. Yes, it’s as good as you’ve heard. This was before Billy started dating Tila Tequila and D’arcy gave it all up to work at a car wash. When the best was still classic. This entry was posted in Food, Music, Restaurant Reviews and tagged austria, burrard, cuisine, dinner, downtown, expensive, fancy, French, le crocodile, rich, Vancouver. Bookmark the permalink.